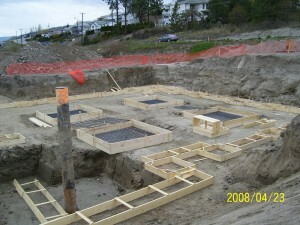 When building your footings, ensure they are built level to within a tolerance of ¼” and that they are troweled smooth. If the footings are not level and smooth, it will create unnecessary work later when it is time to plumb the walls. If your project has stepped footings, try to maintain elevation changes in 12″ or multiples thereof. This will minimize waste and speed up construction significantly. For Quad-Lock walls with nominal concrete thickness of 8″ or less, the standard footing width of 16″ is usually sufficient but check with your local building department. Walls 10″ and thicker are usually engineered, so the engineer will specify footing widths. 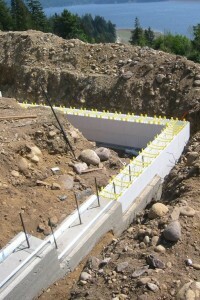 Footings R403 or ACI332 General requirements for ICF footings. Minimum Footing Sizes Division B, Table 9.15.3.4. Minimum prescriptive width of strip footings supporting interior and exterior walls based on number of floors supported. Footing Width adjustment Division B, Section 9.15.3.5. 1) c 150 mm for each storey of flat insulating concrete form wall construction supported by the foundation wall. Foundation Wall Bottom Lateral Support Division B, Section 9.15.4.4. Bottom lateral support is when the foundation wall supports backfill not more than 1.2 m in height, is supported at the footing by a shear key and at the top by the ground floor framing, or is doweled to the footing with not less than 15M bars spaced not more than 1.2 m o.c. 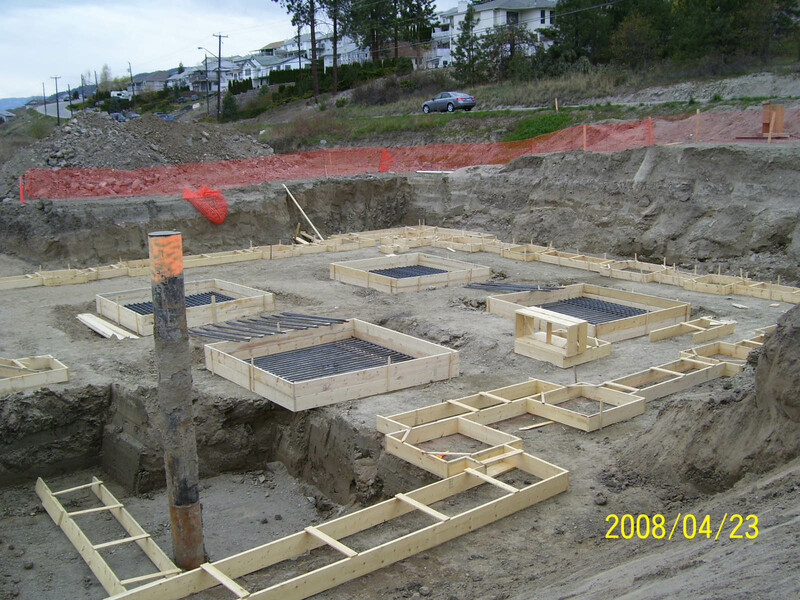 Building Tips: When pouring your footings:When placing rebar dowels, take into account the panel thicknesses. 1. Level them to within a tolerance of ¼”. 2. Trowel footings smooth to prevent rough surfaces. 3. Ensure that all steps are 12″ or any multiple thereof to match the height of the panel. The few extra minutes spent ensuring your footings are level and smooth will save hours in setting up the wall! Note: Steps heights should be designed in 12″ increments to suit the system or any multiple thereof. If the steps are not in 12″ increments, cut the panels to fit the footing steps.